Boeing's Crew Space Transportation CST-100 Starliner spacecraft is one step closer to carry astronauts to space from the American soil, as its engines have recently undergone a series of hot-fire development tests. The tests were carried out by Aerojet Rocketdyne at NASA's White Sands Test Facility in New Mexico. The three Reaction Control System (RCS) engines that were successfully hot-fired are part of the spacecraft’s service module propulsion system, being currently developed by Aerojet Rocketdyne. 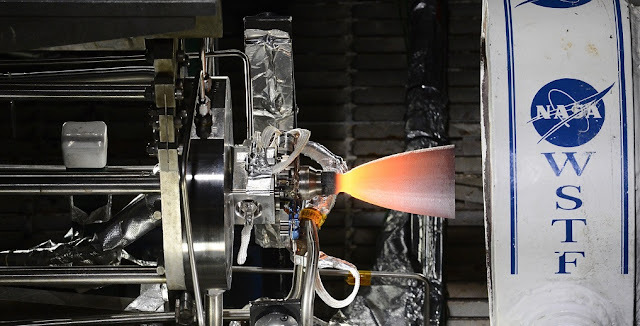 The Sacramento, California-based rocket propulsion manufacturer, announced on Monday, July 25, that each RCS engine was tested up to 4,000 pulses and 1,600 seconds. According to the company, it was the longest accumulated time ever conducted on a lightweight thruster with a composite chamber. "The successful RCS engine tests demonstrated durability and long operational life capabilities meeting the Starliner requirements for composite thrust chambers, which are crucial to mission success and astronaut safety. We look forward to qualifying the engines and continuing our nation's legacy of delivering humans into space," Aerojet Rocketdyne CEO and President Eileen Drake said in a press release. The RCS engines are designed to provide on-orbit maneuvering functions, as well as re-boost capabilities for the space station. Under its Commercial Crew Transportation Capability (CCtCap) subcontract to Boeing, Aerojet Rocketdyne is responsible for the design, development, qualification, certification and initial production of the Starliner’s service module propulsion system, including the development and testing of 28 100-pound thrust class RCS engines. The spacecraft’s service module propulsion system will be necessary for Starliner’s activities during a nominal flight to the International Space Station (ISS). It will provide all propulsion needs required for launch vehicle separation, docking and undocking from the ISS, as well as separation of the crew and service modules during the re-entry into Earth’s atmosphere. The system will also provide integrated launch abort capability on the pad and during ascent. "Aerojet Rocketdyne is leveraging adaptations of proven hardware and technologies to deliver an affordable reliable propulsion system that can be counted on to perform throughout the spacecraft's mission and ensure the safety of the astronauts and success of the mission," Terry Lorier, Aerojet Rocketdyne's CST-100 service module propulsion system program manager, said in November 2015. Boeing’s CST-100 Starliner is 16.5 feet (5.03 meters) long and 15 feet (4.56 meters) in diameter. It can carry up to seven passengers, or a mix of crew and cargo to ISS. The spacecraft is designed to remain on-orbit for up to seven months with reusability of up to ten missions. First uncrewed orbital test flight of the Starliner spacecraft is currently scheduled for December 2017. The capsule will carry its first two astronauts to ISS in February 2018.